There is so much to prepare when you’re expecting a baby — especially when it’s the first time. In the midst of setting up the nursery, making extra trips to the doctor for prenatal appointments and securely fastening your brand new baby car seat, it’s surprisingly easy to forget about getting a plan in place for newborn health insurance coverage. Whether you, as a parent, have health insurance, but don’t know much about it, or don’t have health insurance at all, navigating the process of getting your newborn health insurance coverage can be tough. Unfortunately, health insurance for newborns isn’t something that just happens on its own. While there is a short buffer period built in to give newborn’s coverage through his/her mother’s insurance, the longer you wait to get newborn insurance coverage in California, the more you will end up having to pay. While the Affordable Care Act and California State Laws make it mandatory for health insurance companies to accept newborns to health insurance plans, there’s no guarantee on pricing. 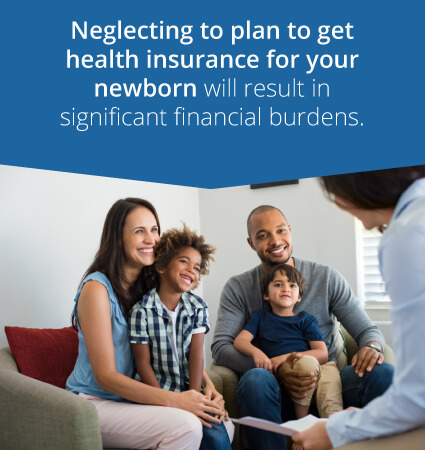 If you fail to do your part to get your newborn on a health insurance plan, you could end up spending a significant amount of money. 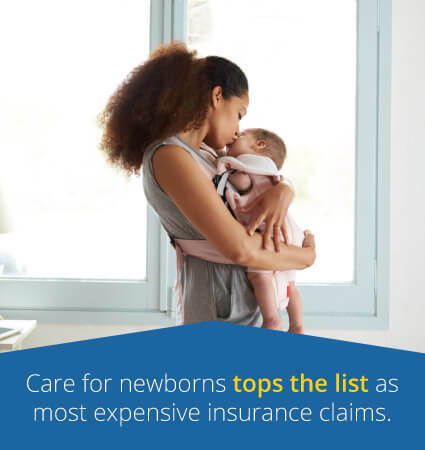 Care for newborns tops the list as most expensive insurance claims. The key to minimizing cost and making sure your new addition is covered is planning. There’s a lot to do when you’re planning for a new member of the family, especially in those first 30 days. If you haven’t decided what to do about getting insurance for your newborn in California before your little one arrives, it can be easy to forget insurance coverage in the midst of adjusting to life as a parent. When you do remember, there’s often paperwork that needs to be completed, and coverage isn’t instant — leaving your new bundle of joy at risk of being without health insurance, and you with the significant financial burden that comes with post-partum out-of-pocket expenses. So what can you do to ensure your baby is protected? If you have your health insurance policy, your baby is born into coverage, right? Sort of. For the first 30 days of your newborn’s life, he or she will be covered as an extension of the mother, under her policy and her deductible. Starting on day 31 of the newborn’s life, your baby will need to have his or her policy. That policy could simply mean adding your newborn to your employer insurance plan, or turning your individual plan into a family plan; but don’t forget that takes time, paperwork and money. If you don’t have a plan in place to get coverage immediately after your little one is born, you’ll miss out on having some of those first few well-baby checkups completely covered. If your baby goes even one day without coverage between being on the mother’s insurance and being added to his or her own insurance plan, you could be subject to an additional 20% cost penalty during the first year of your baby’s health insurance coverage — which is already the most expensive year for health insurance. If the mother and father of a newborn do not have health insurance, then all expenses must be paid out of pocket. 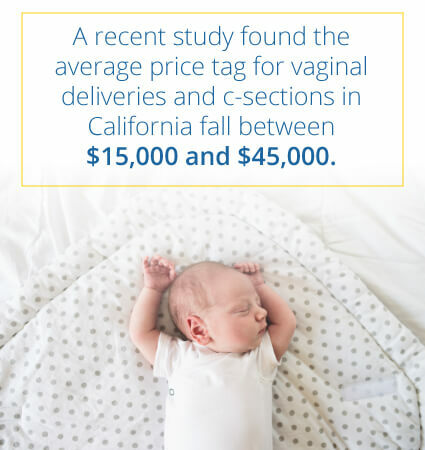 A recent study found the average price tag for vaginal deliveries and c-sections in California fall between $15,000 and $45,000. That’s a huge financial burden for new parents to take on. If that isn’t enough of a reason for you to get health insurance before your newborn arrives, the possibility of putting the baby’s health at risk should be. Although newborn babies are covered under their mother’s health insurance policy for the first 30 days, not every mother has health insurance. In this case, babies whose mothers do not have health insurance are not covered. Complications that arise during birth or shortly after will continue to add to the financial burden. Even without complications, there are several essential doctors’ appointments during the first 18 months of a child’s life. These office visits are considered preventative care and are covered if you have health insurance. Without it, you either skip the appointments, which can be detrimental to your child’s development and health, or you pay for all of those appointments out of pocket. Not having insurance for a newborn is significantly more expensive than it is for an adult. While everyone welcoming a new baby into their life is going to see an increase in health insurance costs, being proactive can ensure that those costs are manageable. The reason it’s important to plan to get insurance for newborns in California is that you need time to gather quotes and review benefits. Health for California is a great place to start, and it can save you a lot of time. Health for California is a health insurance agency that has developed a free, no obligation, one-stop-shop website for health insurance quotes — regardless of whether you’re searching for a new family plan, or child-only health insurance plan. It is certified to give Covered California quotes as well as private insurance company quotes. The simple online form asks you a few basic questions and provides a list of health insurance plan results that you can compare side by side. It’s more expensive to add your newborn to your pre-existing plan. You’re paying for health insurance for your newborn, but they won’t be living with you. You’re paying for health insurance for your newborn, but they’re not a part of your tax household. The Covered California Health Exchange is a government agency that helps Californians comply with Obamacare. To comply with Obamacare, you need to have insurance coverage from a qualified health plan that meets the government’s requirements. While you usually can only enroll during the open enrollment period, the birth of a child gives you the ability to apply for Covered California health insurance outside of the open enrollment period. The cost of adding your newborn to your pre-existing plan is high. You and your partner do not currently have insurance. You and your partner would like to get on an insurance plan together when the child is born. Your income level may qualify you for discounted rates — all of which you can find on the Health for America website. There are additional parameters for pregnant women with low incomes, too. As a female who is expecting, you could qualify for Medi-Cal. Entering your household income information in the optional section of the forms will ensure all of the plans you are eligible for will appear in the results. As the mother and father of the newborn, you may share a health insurance policy, or you may have two separate policies. You may both be a part of a group plan through your employer, or you may each have individual insurance plans. Since California allows newborns to be added to either mother or father’s insurance policy, regardless of marital status, several scenarios may exist for mothers and father when it comes to getting insurance for a newborn in California. 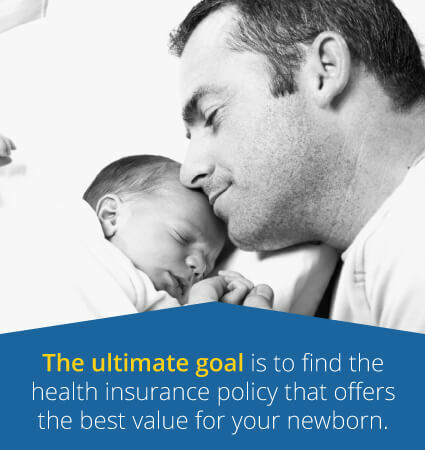 The ultimate goal is to find the health insurance policy that offers the best value for your newborn. Once you’ve decided on a health insurance plan that’s fits of your new addition, you can always change months or years down the road if you find a health insurance policy that has better benefits or a more affordable cost. Obtaining insurance for your newborn is important, but it doesn’t have to be a plan that lasts forever. How much will it cost to add my newborn to my group plan? What are the benefits that are included in that price? Are there any specific to newborns? What paperwork do I need to fill out to add my newborn to my group plan? What is the deadline to have the paperwork submitted? The mother and father of the baby should compare notes on how much it will cost to add the child to the group plan and should also review the benefits of each plan to determine the best value. If one parent has health insurance through an employer, and the other parent has an individual health insurance plan, review the cost and the benefits to see which policy is best for your newborn. How much will it cost to add my newborn to my individual or family plan? What process do I need to follow to get my newborn added to my plan? When will coverage begin for my newborn? Will the coverage for my newborn be the same as my coverage? If this is not your first child, you may be pleasantly surprised to find that the increase you had with the first baby will not occur with your second or third. It’s also important to note that when you add another child to the family, it’s often worth revisiting health insurance plans for the entire family. For example, you may have your child on a separate plan, but now that you have two children, there may be a better family plan rate available. If parents are not on the same individual or family health plan, it’s important to compare coverage to see whether the mother or father’s health insurance policy offers the better value for the newborn. This may also be an opportunity to get more value from your health insurance policy by searching for a family health insurance policy that covers both parents and the new child. If insurance is available through the mother or father’s employer, talk to the human resources office about what coverage is available. Remember that in California, a newborn can be added to a mother or father’s policy within the first 30 days. The parents of the child do not need to be married. If insurance is not available through an employer, begin shopping for an insurance policy. Whether you’re searching for an individual plan that you can eventually add your child to or a child-only insurance plan that will cover your child, search online through the Health for California to learn what coverage is available and how much it will cost. You can also learn more about the different categories of plans as you browse our website to see what plan offers the best value for you and your newborn. Don’t Get Stuck Without Newborn Insurance Coverage in California. Neglecting to plan to get health insurance for your newborn will result in significant financial burdens. If a mother has a child without insurance in California, she could owe up to $45,000 for the delivery of her child alone. Even if both parents have insurance, failing to get a plan in place for their newborn to have coverage on day 31, after the 30 days of coverage as an extension of the mother, can result in paying an additional 20% more the entire first year as a penalty for not having coverage. At Health for California, our goal is to make it easy for Californians to get the health insurance coverage they need for themselves and their newborn. Our website is focused on educating those who may not know much about health insurance, and to make it easy to find an affordable health insurance solution for mothers, fathers and children. Begin your new adventure as parents by requesting a free, no obligation quote on our website so you can be sure your newborn has the best health insurance plan from the moment they arrive.